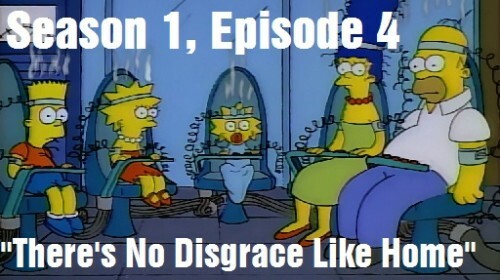 When it comes to the Simpsons, they are not a very high-end family. They aren’t very wealthy, they don’t share the same values or manners as other families, and as an outsider looking into their family dynamic, I’m sure a lot of questions and concerns would arise from that observation. In this episode, Homer takes a look at his own family and compares it to the other families in town, wondering if maybe somewhere down the road something went wrong, and puts his family on a quest for improvement, with “shocking” results. This episode debuted on January 28th, 1990 and was the fourth episode to air and the fourth episode written for the show. 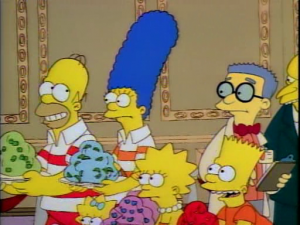 The chalkboard gag for this episode is “I will not burp in class,” while the couch gag features the entire family trying to sit on the couch at once, which results Homer (of all people) getting squished out and landing on the floor. Homer’s boss, Mr. Burns, is having his annual employee picnic at his mansion, and the morning of the big event, Homer is in an absolute frenzy of getting his kids to not act up during the outing and making sure everything is absolutely perfect. Apparently Mr. Burns is a stickler for families that are well-behaved and harmonious with each other, and tends to fire employees whose families misbehave or make a scene. In fact, all of the families are so scared of Mr. Burns that they even let him win the annual sack race every year, for fear of what would happen if he didn’t win. During the picnic, the kids run amok, disturbing the local wildlife, and climbing on all the different fixtures, causing Homer to be on constant watch-duty. Even Marge, the most cool and collected member of the family, gets incredibly tipsy after drinking several cups of “punch,” causing her to dance around and sing; creating her own scene that Homer also watches disappointedly. As the family is leaving, Homer notices another family that is very well-behaved and good-mannered and he starts to compare the family to his own. 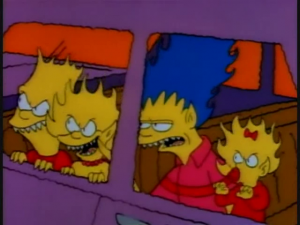 The other family’s kids open the car doors for each other while Bart and Lisa fight over who gets in first, and the wife of the husband offers to drive back while Marge is still very much drunk and feeling sick. Homer is ashamed and disappointed by this observation as the show closes on the first act. The Simpsons go to therapy and meet Dr. Marvin Monroe, but at first, his tactics seem to be falling on deaf ears and closed minds. Homer doesn’t listen during one of the exercises and Bart takes the padding off of the foam rubber aggression mallets, swinging the metal rod at the doctor’s shin. He decides that the only way the family is going to get cured is if he uses extreme measures, so he hooks the family up to the electric generator. In an all-time classic Simpsons moment, the family misses the point of the exercise and starts shocking each other continuously (even baby Maggie joins in on the fun), causing the lights to flicker and scare off all of the other patients. Dr. Monroe stops the exercise and claims that the family cannot be cured and that they need to leave. Homer, remembering an important part of the commercial he saw, states that the ad promised family bliss, otherwise they would get double their money back. The doctor reluctantly pays the family double their entry fee and sends them on their way. In a last minute realization of togetherness and happiness, the Simpsons go to purchase a brand new television to replace the one they pawned off; ending the episode on a very tender moment. Although I don’t not remember seeing the episode in full until the Season 1 DVD released, I definitely remembered the classic electric generator scene. It was definitely used in a future clip show, for sure, but even then, that’s just a scene that has always stuck with me, regardless of how or when I saw it. It’s just one of those moments that you can never forget. I think it’s safe to say that this episode is an absolute benchmark for the series. If not for the final, big scene I’ve been putting a lot of my focus into, but also just because this episode plot confirms the type of family the Simpsons are and what they will continue to be for the rest of the series. They don’t have a high standard of living, they’re not the brightest crayons in the box (with exception to Lisa, but this is before the “brainiac” image really starts to get pushed, plus Lisa does have a very “Simpson-esque” side to her; all things considering), the kids are pretty unfiltered for their age and don’t give a lot of respect to their father, and they just don’t give off that typical American family vibe that you hear about on television and other forms of media. And personally, I think it’s great that they break that image, because every family in the world, real or fiction, has their own unique dynamic, and honestly, that’s the way it should be. A good family will always find a way to work things out, no matter the circumstances, and the Simpsons did just that at the end of this episode. Homer was disappointed at his family, the kids and Marge resented Homer for making them do the therapy, but they all came together, ripped off a therapy clinic, and left the place richer, happier, and most important, left the building together, united as a family unit. I’m not advising any family in real time to try conning a clinic out of 500 dollars, but for the purpose of this episode, it works, and was truly my favorite moment and best moment of the entire episode. Maybe of the entire season too, but we still have nine episodes left before we make that judgment. As far as jokes are concerned, I think one joke that really caught me off guard in this re-watch was the fact that the family Homer was envious of at the end of Mr. Burn’s picnic was actually in the family therapy center waiting room before the Simpsons went in for their session. This was clearly a visual gag set up by the Simpsons writers, one that could very easily be overlooked if you don’t focus on specific details (like what those characters looked like), but I also think it’s a very nice message about how some families put up a mask or a façade when in public to hide their happiness. Believe it or not, not all families are necessarily happy all the time, and every family, even the closest ones, can have their issues and dirty laundry. Some just prefer not to air it in public and work on those issues in private where, arguably, that should be the case in most instances. 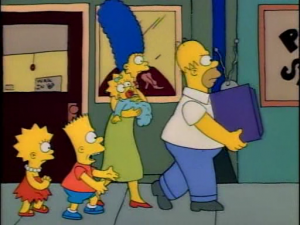 I just thought it was funny to see that they were there at that point in time, and it was almost kind of cosmic in the sense that the Simpsons got to leave the building in harmony while the other family may have been unable to do so; essentially switching around the terrible feeling Homer had at the end of the first act. I also really enjoyed Homer’s comment on Marge’s engagement ring, implying that the engagement ring was worth less than a $150 dollar television. 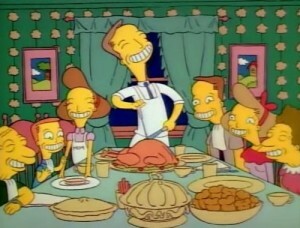 This episode also features the first instance of the Homer Simpson “Mmm…” joke, where he makes that noise followed by some kind of food item or an item that sounds like it could be digested (in the mind of Homer Simpson anyway), and he does it while admiring the lovely gelatin desserts that Marge has made for the picnic. 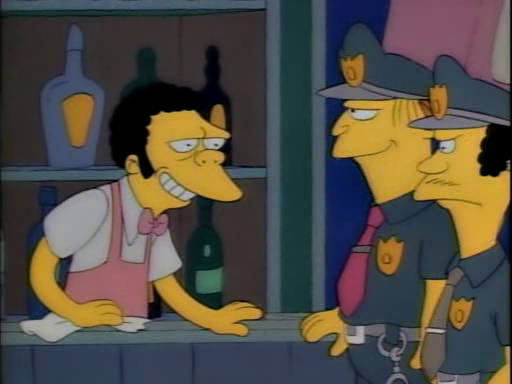 He makes his pleasure known by saying “Mmm…marshmellow.” And even though I am 3 episodes late on this, Homer does have another vocal joke in the series in the form of “D’oh,” a sound made by Homer’s voice actor, Dan Castellaneta when he read “annoyed grunt” in an episode screwed. Homer first did this in the episode “Simpsons Roasting on an Open Fire,” the first episode of the season, but since I’m just so used to Homer doing that in the first place, it didn’t cross my mind to mention it. I will not be calling attention to any of these gags throughout the series though (unless an extremely humorous one emerges), just because of how numerous and common they are, but I did figure this would be a good time to mention them now, at least while we are still this early in the series. So after my incredibly positive analysis earlier on the ending of the episode, you probably think I’m going to be pretty generous and enthusiastic about this one. Honestly…with exception to the family therapy segment (which is basically the entirety of Act 3)… I’m not really a big fan of this story. I just don’t like the way Homer thinks in this episode. He spends too much time focusing on how he wants his family to be, whether it’s to score some brownie points with his boss, or just to appease his own wants and needs at home. Given, his kids can be a little too much to take sometimes, but they are kids! By pushing and forcing them into some kind of façade to make him look great, naturally the kids are going to want to rebel as much as possible; so if anything, Homer had been literally asking them for that kind of behavior all along. Even during the therapy session, when Dr. Monroe asked the family to illustrate the roots of their unhappiness, Marge, Lisa and Bart all drew Homer, while Homer ignored the question and drew a plane crash. This goes to show you that Homer wasn’t doing much better as the head of the household as the rest of the family was doing with giving him respect. The entire family was at fault, but I think the episode focuses a little too much on the Homer side of the story, when he was probably the biggest instigator of the family’s problems. I guess you could say that I just couldn’t really sympathize with him, and that’s probably why I have a hard time with this episode. With that being said though, once the family gets to the therapy center, I think it picks up phenomenally well. It has a lot of funny moments and gags, it’s interesting to see where Dr. Monroe goes next with his treatments (and how the family continues to mess them up), and the ending was the most perfect way to end the episode. It ends with them taking all of that pent-up aggression and releasing it at each other in a creative way, and then they celebrate their “victory” by going to purchase a new television afterwards; the very same object that got them to that lowest point once Homer sold it to begin with. It’s a good finale that saves this episode for me, quite honestly. I just wish I could have been more invested in the story…you know, before the final act of the episode. So yeah, I was a little late with this one, but honestly, this was probably the episode that took the least amount of time to make, so I am definitely starting to get this down to a science now. I just had a lot of stuff to get done last weekend, as I did get back into streaming again and I’m still trying to make some major headway with all of my videos as well (since I do have a vacation coming up). I’m not going to promise an issue this weekend, but if I get some time after all the craziness subsides, I will start working on the next episode, which was probably my favorite episode the first time I watched through Season 1, so it should be a good time!